If you’re serious about baking, you’ve probably heard of Rose Levy Beranbaum. After all, she has written the bible(s) on baking—specifically, The Cake Bible, released in 1988; The Pie and Pastry Bible (1998); The Bread Bible (2003); and The Baking Bible (2014), among her other seven titles. She has imparted her wisdom on home bakers for decades, so what could we possibly still have to learn from Levy Beranbaum in her latest work, Rose’s Baking Basics ? It turns out, quite a lot. Unlike her other books, this one feels like a master class with the master herself, with step-by-step photographs of every single recipe included. As a reader and baker, it is reassuring to follow a recipe written in Levy Beranbaum’s precise words. In this book, she makes a point to be even more concise than usual, specifying how she bakes in real life when no one is watching (e.g., none of this “add in previous prepared toasted nuts”; here, she works this into the timing of her baking instructions). The celebrated baker is perhaps best-known for her original love—cakes—as well as her ability to give meticulously precise details. 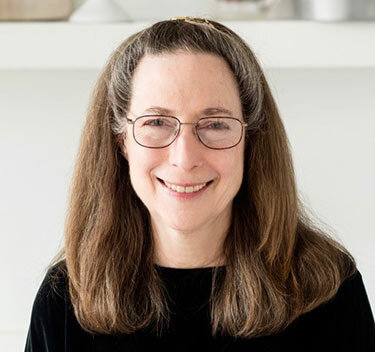 Levy Berenbaum says that her most requested recipes remain her neoclassic European-style buttercream (which does not require a thermometer) and her downy yellow cake, both from The Cake Bible. And these recipes are among the ones she feels every baker should have in their bag of tricks. “Novice bakers should have a good basic yellow layer cake and a reliable pie crust recipe,” she states. In this new book, Levy Beranbaum goes well beyond those two classics, sharing recipes for My Best Brownies; a deceptively plain-looking flavor bomb of a cake she calls Triple Lemon Velvet Bundt Cake; and a Creamy Cheesecake, for which she starts the recipe prep by instructing you to take the cream cheese out the fridge 1 hour prior to baking—a detail other cookbooks might glaze over. “I now write recipes exactly the way I actually make them,” she shares. 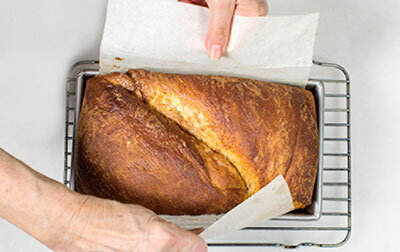 These small changes in her baking instruction coupled with her troubleshooting of common baking problems show that you can never stop learning and changing. But what’s more unbelievable is that these master recipes are such a far cry from the desserts that Beranbaum Levy grew up with as the child of a dentist. Levy Beranbaum’s babka recipe, along with her Apple Cinnamon Coffee Cake, are eminently suitable for a Yom Kippur break fast table laden with sweet dairy treats. 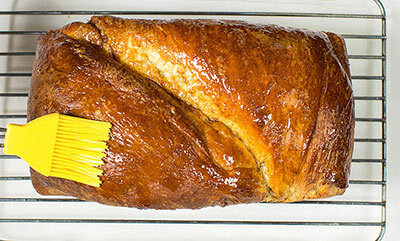 Food photographs by Matthew Septimus. In Rose Levy Beranbaum’s new book, both the coffee cake and babka recipes include even more step-by-step photos than are included here. Apple coffee cake is a real favorite, and as a sheet cake it is perfect for a party or picnic. 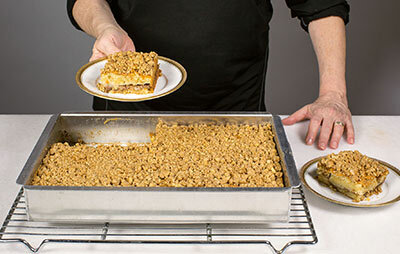 This soft, buttery layered cake is filled with tart apples and a layer of cinnamon streusel, and then topped with a crunchy streusel topping. In the microwave in a 1 cup glass measure with a spout, or in a small saucepan over medium-low heat, melt the butter. In a food processor, pulse the walnuts, granulated and brown sugars, and cinnamon until the walnuts are coarsely chopped. Into a small bowl, spoon out 1 1/4 cups to use for the filling. To the nut mixture remaining in the food processor, add the flour, melted butter, and vanilla and pulse briefly to form a coarse, crumbly mixture for the topping. Scrape the crumb topping into a medium bowl and refrigerate for about 20 minutes to firm up the butter, which will make it easier to crumble. Twenty minutes or longer before baking, set an oven rack in the lower third of the oven. Set the oven at 350º. About 1 hour ahead, set the butter and eggs on the counter at room temperature (65º to 75º). Shortly before mixing the batter, peel, core, and cut the apples into 1/4-inch thick slices. Place them into a small bowl and sprinkle them with the lemon juice. Into a medium bowl, weigh or measure the eggs. Add 1/4 cup of the sour cream and the vanilla and whisk lightly until combined. In the bowl of a stand mixer fitted with the flat beater, mix the flour, sugar, baking powder, baking soda and salt on low speed for 30 seconds. Add the butter and the remaining 3/4 cup sour cream and mix on low speed until the flour mixture is moistened. Raise the speed to medium and beat for 1 1/2 minutes. Scrape down the sides of the bowl. Scrape about two-thirds of the batter into the prepared pan and smooth the surface evenly. With your fingers, sprinkle lightly with the reserved crumb filling (do not press it into the batter). Quickly top with four rows of apple slices. 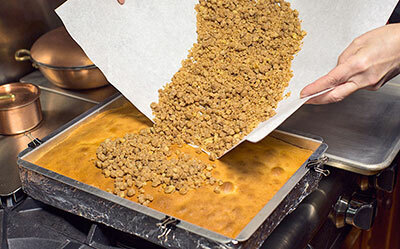 While the cake is baking, use your fingertips to pinch together the crumb topping, breaking up the larger pieces so that about one-third of the mixture is in 1/4-inch balls or clumps. (Do not make the balls larger because they will be hard to cut when serving.) Let them fall onto a large piece of parchment and add the rest of the lightly pinched crumbs. Remove the pan from the oven and gently place it on a wire rack. 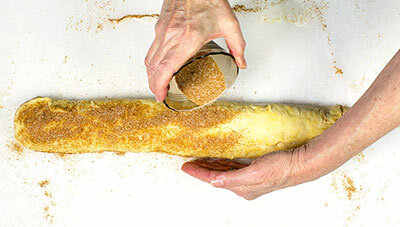 Use the parchment as a funnel to strew the crumb topping quickly and evenly over the surface. Let the cake cool completely in the pan on a wire rack for about 1 1/2 hours. 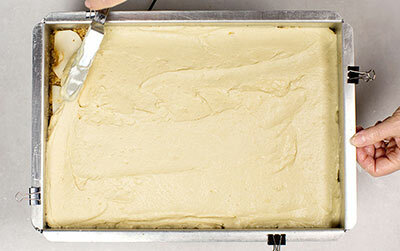 To serve, run a metal spatula between the sides of the pan and the cake, pressing firmly against the pan. Cut the cake into squares and lift them out onto serving plates with a small pancake turner. *Cake strips help to keep the crust from browning too deeply during the long baking period. These silicone cake strips slow down the baking at the sides of the pan, which otherwise would set sooner than the center, resulting in doming in the middle and dryness at the edges of the cake. If you don’t have these, you can make your own reusable cake strips using a strip of aluminum foil: Cut it long enough to encircle the pan with a little overlap, triple the height of the pan. Wet some paper towels, fold them to the height of the pan, and lay them along the middle of the foil strip. Fold the top, bottom, and ends of the foil over to encase the paper towels. Wrap the strip around the pan and secure it with a metal paper clip or clamp. If you prefer, it’s fine to add the crumb topping before baking, but be sure to tent the cake loosely with foil after the first 40 minutes of baking to prevent overbrowning. Everyone loves babka, an egg- and butter-rich dough spiraled with a cinnamon sugar filling that is a cross between a pastry and a bread. The supple, silky dough is a pleasure to work with. PLAN AHEAD: This babka takes a minimum of 6 1/2 hours from start to finish, plus 1 1/2 hours to cool before slicing. It can be refrigerated overnight at different stages, so you won’t need to be home for 6 1/2 hours straight. Plan to make the starter a minimum of 1 hour, or up to 4 hours, ahead of mixing the dough. A minimum of 1 hour ahead, set the butter for the dough on the counter at room temperature (65º). Into two separate small bowls, weigh or measure the water for the starter and for the dough and cover them. Into a 1 cup measure with a spout, weigh or measure the eggs. Whisk lightly and pour 1 1/2 tablespoons through a strainer into another cup to reserve for the filling. Cover both cups and refrigerate. In the bowl of a stand mixer, place the water, flour, dry milk and yeast. Whisk by hand for about 2 minutes, until very smooth, to incorporate air. The sponge will be the consistency of a thick batter. Scrape down the sides of the bowl. Cover with plastic wrap and set the sponge aside while you make the flour mixture. In a medium bowl, whisk together the flour, sugar,and yeast. Then whisk in the salt. Sprinkle the flour mixture over the sponge, forming a blanket of flour, and cover it tightly with plastic wrap. Let it ferment for 1 to 4 hours at room temperature, or 1 hour at room temperature and up to 24 hours refrigerated. During this time, the sponge will bubble through the flour blanket in places. Attach the dough hook to the stand mixer. Add the butter, eggs, water,and vanilla to the flour covered sponge and beat on low speed for about 1 minute, or until the flour is moistened. Raise the speed to medium and knead for about 7 minutes, or until the dough is shiny and very elastic. It will not clean the sides of the bowl, but will be very stretchy when pulled with your fingers. It will be very sticky. Using a spatula or dough scraper that has been lightly coated with nonstick cooking spray, scrape the dough into a 2 quart dough rising container or bowl that has been lightly coated with nonstick cooking spray. It will be very soft and elastic and will stick to your fingers. Do not be tempted to add more flour at this point; the dough will firm up considerably after rising and chilling. Push down the dough and lightly coat the surface with nonstick cooking spray. Cover the container with a lid or plastic wrap. With a piece of tape, mark the side of the container at approximately where double the height of the dough should be after rising. 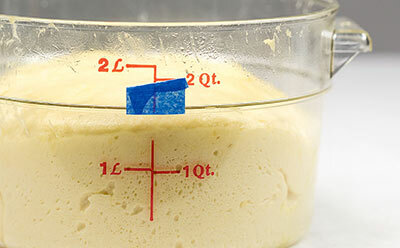 Let the dough rise in a warm place, ideally at 75º to 85º, until it reaches the mark, 1 to 1 1/2 hours. Lightly flour the counter and your hands, because the dough will still be a little sticky. Using a spatula or dough scraper that has been lightly coated with cooking spray, remove the dough to the counter. Deflate it gently with your fingertips. Round the dough by gently stretching it out and folding it in to the center on all four sides. The dough will be very soft. Using a medium-mesh strainer, sift the granulated and brown sugars and cinnamon into a medium bowl. Whisk to combine them evenly. Into a small bowl, spoon 2 tablespoons of the cinnamon sugar mixture; reserve it. Turn the dough onto a well-floured counter and press down on it with floured hands to form a rectangle. Roll the dough into a 16-by-14 inch rectangle, flouring the counter and the rolling pin, if necessary, to keep the dough from sticking. It will be a little under 1/4-inch thick. Brush off any excess flour from the top. Brush the entire surface of the dough with the beaten egg, using as little as possible to create an even coating; too much egg wash will dissolve the sugar, making the dough more difficult to shape. Sift the larger portion of the cinnamon sugar mixture onto the dough and use your fingers to smooth it as evenly as possible over the dough. Starting from the top, use your fingers and a long plastic ruler to roll up the dough, using the ruler to help support the dough as you roll it. 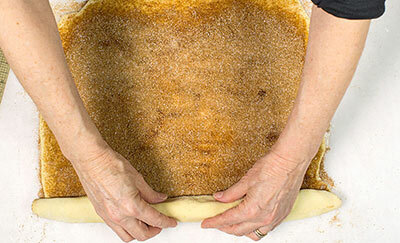 Slip the edge of the ruler slightly under the dough and use it to lift up and roll/push the dough toward you. With each roll, dust any flour from the surface of the dough. 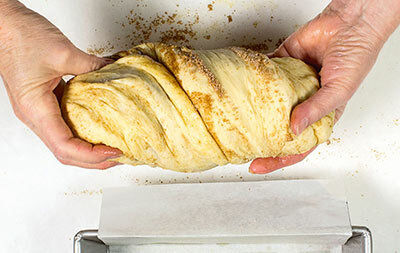 Press firmly, squeezing gently with your fingers, all along the dough roll to keep it from separating, easing the dough gently toward the ends. Work carefully without rushing. When you reach the bottom edge of the dough, pinch it against the outside of the dough to make a tight seam. Set the dough roll seam side up. Pinch the ends of the dough together firmly. To prevent it from becoming thinner at the ends, with one hand hold down the dough near an end and with your other hand, push in the end. Repeat with the other end. The roll should be no longer than 16 inches. Brush off any excess flour. Brush the top of the roll with the remaining beaten egg, sprinkle with the reserved sugar and cinnamon mixture, and fold the roll over itself. 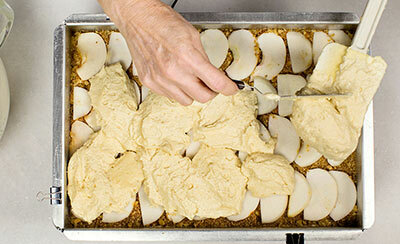 Gently twist the dough twice and set it into the prepared loaf pan. Press it down firmly into the pan. The highest point will be about 1 inch from the top of the pan. Cover the pan loosely with plastic wrap, lightly coated with nonstick cooking spray. Let the dough rise, in a warm place (ideally at 75º to 85º), for 45 minutes to 1 1/2 hours, or until the highest point is about 1 inch above the top of the pan. Forty-five minutes or longer before baking, set an oven rack in the lower third of the oven. Place the cast-iron skillet on the floor of the oven. Set the oven at 350ºF/175ºC. Lay a sheet of parchment on the counter and place a wire rack on top. Remove the babka from the oven, lift it out of the pan by grasping the two ends of the parchment, and set it onto the wire rack. If necessary, use a small metal spatula to dislodge the babka at the short ends of the pan not lined with the parchment. Slip out the parchment from under the babka and brush the cream onto the top and sides of the babka to soften it and give it extra shine. Cool completely, about 1 1/2 hours. STORE IN A PAPER BAG: room temperature, 2 days; AIRTIGHT: frozen, 2 months. 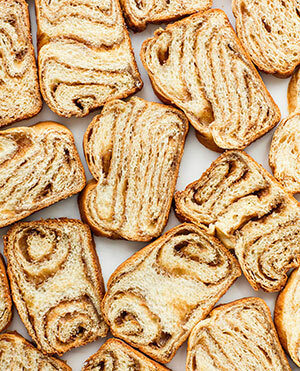 APPLE CINNAMON COFFEE CAKE and BABKA SWIRL LOAF are excerpted from Rose’s Baking Basics © 2018 by Rose Levy Beranbaum. Photography © 2018 by Matthew Septimus. Reproduced by permission of Houghton Mifflin Harcourt. All rights reserved. Yum. love your writing Jessica. keep up the good job. Does anyone have a recipe for a cheese babka? I used to purchase it at a bakery in upstate New York but they have not been in business for years.